Many of these were Spring and summer greens; others were warm weather crops such as squash — and 2900 of these were tomatoes. 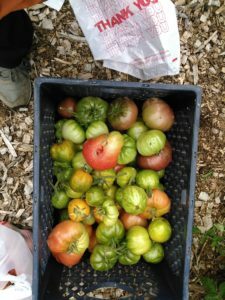 So how did your Giving Garden Starts produce in 2018? We were tired and are happy. Already we’re thinking about 2019. Within the next several weeks you should see a survey sponsored by the City of Seattle asking how the Sprouts grew for you in your Giving Gardens. But we can tell you from our own personal experience: those starts resulted in many tons of produce sent to food banks and to their clients, to shelters, and to kitchen missions. Seattle’s Gardeners: you’re great! This entry was posted in Harvest Photos, SGGN Sprouts on October 21, 2018 by Dianne. © 2019 Seattle's Giving Garden Network Log in.